In anticipation of their long-awaited third album “What Comes To Mind” scheduled to drop in the Fall, UK’s funk powerhouse The Haggis Horns present “Return Of The Haggis EP”, a 12″ taster of what to expect on the new full-length with 3 tracks of funk, soul & boogie goodness! Leeds-based instrumental outfit The Haggis Horns first hit the music scene in 1999 and rose to prominence through their part in the seminal Keb Darge presents The New Mastersounds album on BBE Records. They have since recorded and performed with artists such as Jamiroquai, John Legend, Amy Winehouse, Corinne Bailey Rae, Lou Donaldson, Martha Reeves, The Cinematic Orchestra, Morcheeba, Roots Manuva, Lily Allen, Finley Quaye and Nightmares On Wax, to name a few. Mark Ronson called the band “the best horn section in the world” and was so impressed he recruited them for his TV appearances and tours. With over a decade of activity, 2 full-length albums released on independent UK label First Word Records, various sold-out singles and countless worldwide gigs under their belt, The Haggis Horns have steadily gained a loyal following among soul boys, jazz brothers, funk sisters and break dancers alike. “Return Of The Haggis EP” contains two brand new tunes from the upcoming album plus a previously unreleased remix. A side “I Can’t Stop The Feeling” sees soulstress Lucinda Slim wax lyrical over a boogie-funk instrumental in The Haggis Horns‘ unmistakable style. B-side “Return Of The Haggis” is an uptempo funk number with a contagious rhythm aided by Snowboy on percussion. Both tracks see Pete Shand from The New Mastersounds on bass. The final song on the EP is a remix of the band’s first single “Hot Damn!” featuring the powerful vocals of singer John McCallum. This new version adds some boogie/disco spice to the original’s funk flavour and is exclusive to this 12″. 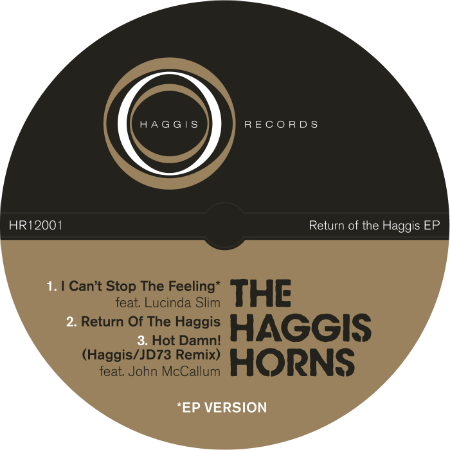 With liner notes by DJ Lubi Jovanovic and the support of Keb Darge and Craig Charles (BBC6), “Return Of The Haggis EP” appears set to confirm The Haggis Horns are one of the stalwarts of funk, and they’re back to prove it!